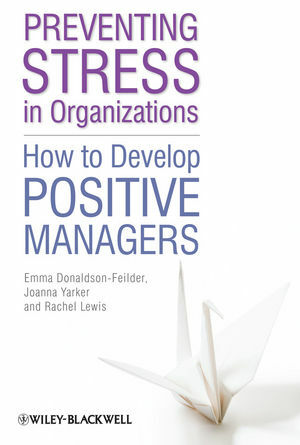 Preventing Stress in Organizations:How to Develop Positive Managersoffers an innovative, evidence-based approach to help managers prevent and reduce workplace stress in their staff. Emma Donaldson-Feilder is a Director of Affinity Health at Work and a Chartered Occupational Psychologist. In addition to her roles as researcher and practitioner, working to improve employee well-being and engagement, she is the author of numerous publications, a regular conference presenter, and a media commentator on issues relating to health at work. Rachel Lewis is a Director of Affinity Health at Work, a Chartered Occupational Psychologist and a lecturer in Occupational Psychology at Kingston Business School. She combines her academic career with regular conference speaking, consultancy and training, focusing on the links between leadership, management and employee well-being. Joanna Yarker is a Director of Affinity Health at Work and a Chartered Occupational Psychologist. She has previously held posts at Goldsmiths, University of London and the University of Nottingham. She writes regularly for academic and trade journals, and offers guidance and training to public and private sector organizations focused on improving workplace health.